Caries is the scientific word for cavity. You can see in the image above how a cavity can start as a small problem and grow to a dangerous dental infection. Most of the time you will never know you have a cavity at its earliest stages. By the time you have sensitivity or a toothache the problem has become severe. When a cavity is close to the pulp the nerve could die or become infected. At this point your choice is to extract the tooth (and the dying nerve that goes with it) or to remove the nerve and disinfect the pulp chamber by having a root canal. You may have heard horror stories about how painful a root canal is. Don’t believe them! With the dental anesthetics we have now, you will be very numb throughout the procedure. After it is complete you may experience some soreness, but as your body heals it should gradually improve until it feels just like any other healthy tooth in your mouth. 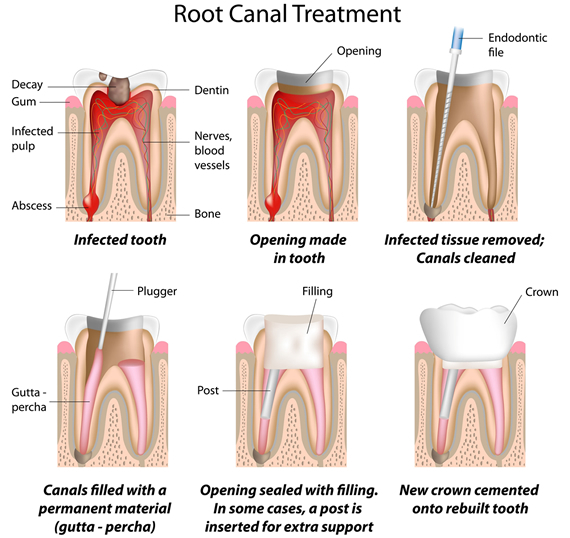 Since the source of your pain is the infected pulp and inflammation inside your tooth, the goal of a root canal is to completely remove the nerve, kill all bacteria, and seal the pulp chamber of the tooth. The process starts by accessing the pulp by making an access hole through the top of the tooth. Small files are then used to clean each canal with disinfectants to ensure that no bacteria remain. Finally a material called gutta-percha is used to fill and seal the canals. After the root canal is complete it is likely that Dr. Scharnhorst or Dr. Hudson will recommend placing a crown over the tooth. Since the tooth has essentially been hollowed out, it is at an increased risk to break if it is not protected. By having a crown placed, you will protect the tooth from the force of your bite. It is always better to preserve your natural teeth if there is enough remaining tooth structure to maintain structural integrity. There are some situations when the tooth is either fractured, or has been damaged so badly that it would have a poor prognosis, even with a root canal. But with enough healthy tooth left it is better to keep your tooth than to have it removed. In cases where root canal treatment, or endodontics, would not be the best option we would walk you through your options. Most likely removing the tooth and replacing it with a dental implant would be the best way to go. Can My Dentist Do Root Canals? 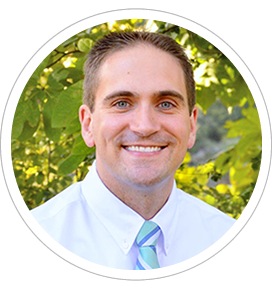 Dr. Scharnhorst has worked hard to learn specialty procedures and has years of experience in performing root canals. We do our best to be an office where you can have most of your dental needs met in one place. Most of the situations that come up can be treated right here in our office. On occasion, however, due to complicated root shapes, or suspicion of a fracture he will suggest you have the procedure done by a specialist. 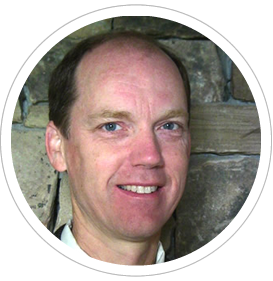 We work closely with Dr. Sam Mumpower and Dr. Jack Smith who are endodontists in Rome, Georgia in these situations.